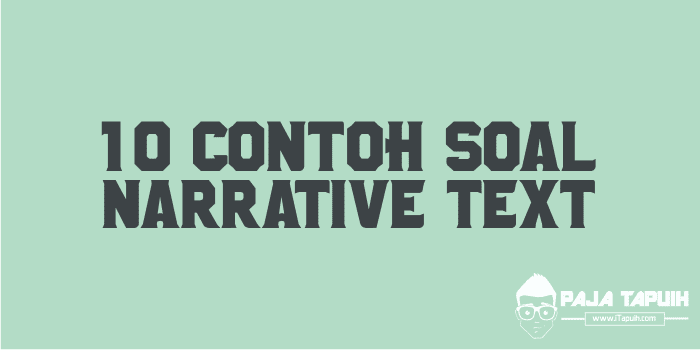 iTapuih.com - 10 Contoh Soal Narrative Text dan Kunci Jawaban Terbaru. Narrative text adalah salah satu jenis text yang bertujuan menceritakan suatu cerita yang memiliki rangkaian peristiwa kronologis yang saling terhubung. Secara sederhana text ini lebih menonjol cerita atau dongeng yang bersifat menghibur. Dalam artikel ini saya akan membagikan 10 Contoh Soal Narrative Text dan Kunci Jawaban Terbaru untuk pelajar Sekolah Menengah Pertama kelas 7, 8 atau 9 SMP/MTs. Soal-soal dibawah ini bisa Anda download pada link bagian paling bawah postingan. A Story From The Farm Yard Two roosters were fighting fiercely to be the king of the farm yard. One finally gained advantage and the other surrendered. The loosing rooster slunk away and hid itself in a quiet corner. The winner flew up to a high wall, flapped its wings and crowed its victory, as loud as it could. Suddenly, an eagle came sailing through the air and carried it off, with its talons. The loosing rooster immediately came out of its corner and ruled the farm yard from then on. 2. What is the main idea of paragraph 3? Read the following text to answer questions number 4 to 7. One day, a mouse deer was walking by the river. He was very starving because he hadn't eaten since morning. It was midday. But he found nothing in the land but dying trees. "Huh... I hate this branches, I don't like it!" The mouse deer was figuring out the way how to reach there. Suddenly, he jumped to the air,'aha. : he then walked to the edge of the river. He didn't see the reflection because the water flowed very fast. He dipped one of his fore legs into the water. A few moment later, appeared Mr. Crocodile showing his sharp teeth. He then laughed, "Ha... ha... ha, you can't run away from me, You'll be my tasty lunch!" said the crocodile. "Of course I can't. You are very strong, Mr. Croco," replied the mouse deer frightenedly. Then, the other crocodiles approached moving slowly.They approached the edge of the river. "But, before you all have a party, I wonder how many your members are there in the river. If I know your number exactly, I can distribute my meat evenly,"said the mouse deer. "Oh...o, great, good idea! But we are a large group, I can't count it precisely," Mr. Croco moaned. "Leave it to me, and I can make it for you!" Now, can you ask the others to line up, from one edge to the other edge of the river? The mouse deer requested. Then the crocodiles arranged themselves in line from one edge to the other edge of the river. The mouse deer jumped to the body of one crocodile to the others while he was counting, 'one, two, three; and so forth up to ten. Then at last he arrived at grassland, and he thanked to the dumb crocodiles. 4. Why did mouse deer want to go across the river? 5. How many crocodiles were there in the story above? Once, two friends were walking through the forest. They knew that anything dangerous can happen to them at any time in the forest. So they promised each other that they would remain united in case of danger. Suddenly, they saw a large bear approaching tern. One of the friends at once climbed a nearby tree. But the other one did not know how to climb. So being led by his common sense, he lay down on the ground breathless, pretending to be a dead man. The bear came near the man lying on the ground. It smelt his ears and slowly left the place. Because the bear did not touch him, the friend on the tree came down and asked his friend on the ground, "Friend, what did the bear tell you into your ears? "The other friend replied, "He advised me not to believe a false friend. 8. What can we get from the story? 10. Where do you think the story happened? Selamat belajar, semoga postingan tentang 10 Contoh Soal Narrative Text dan Kunci Jawaban Terbaru bisa bermanfaat dan jangan lupa share ya.